C. David Johnson is triumphant as the beleaguered president, holding the audience enthralled in a nearly three-hour tutorial of history. Terence Archie is excellent as Reverend Martin Luther King. He portrays the man as a very likable role-model, complete with human frailties. I felt as if I had been admitted to an exclusive cram course to learn about the government in action in the 1960s. 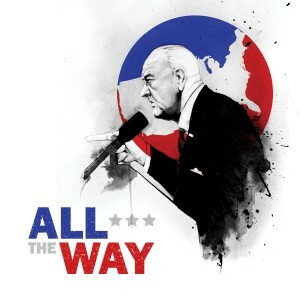 “All the way with LBJ” was Johnson’s election chant. And he had a long way to go! The play produced this winter on stage at DCPA was written by Robert Shenkkan. It was commissioned by the Oregon Shakespeare Festival and premiered there in 2012. It opened on Broadway in March of 2014 and received the Tony Award and Drama Desk Award for Outstanding play that year. Bryan Cranston, currently of television’s “Breaking Bad” fame received the Tony Award for Best Actor for his portrayal of President Johnston. Cranston is re-creating his LBJ role for a PBS television production scheduled for May. The set for the Denver show has the look of a legislative coliseum, with spectators surrounding the center scene, watching every move of the combatants. The cast is large and effective. My recollections of the actual Civil Rights fight are few. But many of the major players became household names: Senator Hubert Humphrey, Reverend Ralph Abernathy, J. Edgar Hoover, George Wallace, Robert McNamara, Lady Bird Johnson, Senator Richard Russell, Walter Jenkins, and Lurleen Wallace, Roy Wilkins, and Katherine Graham. Senator Hubert Humphrey, then senator from Minnesota and Democratic Majority Whip, was Johnson’s “go-for” man – even though LBJ is portrayed as treating Humphrey with disdain. He was subsequently Johnson’s choice for Vice President in the elections that year. Curiously, there was no actual Vice President of the United States from the time President Kennedy was killed until the inauguration of President Johnson in 1965. The play is riveting. Some cast members play more than one role. With such a large cast, I had a difficult time keeping track of who was who. LBJ is center stage, however, with MLK and Hubert Humphrey easily identifiable as integral leaders fighting for Civil Rights legislation. C. David Johnson’s portrayal of LBJ is terrific. He can be delightfully charming one moment, frightfully ruthless the next. The political, system itself is a fearful operation – with egos fighting egos fighting egos, and good men stripped to shreds by unfortunate actions. I’m not certain how much has changed in the political arena in the more-than-fifty years that have passed since the 1964 election. A look at that crucial time of history, as presented in “All The Way” is a birds-eye view of politics and of great and not-so-great men and women. DCPA must be applauded for bringing to Denver audiences such a mesmerizing production of ground-breaking legislation.